Initial ads for the Honda Insight showed young people living a beach lifestyle. LOS ANGELES -- Honda plans a new marketing approach for its Insight hybrid after the Toyota Prius-fighter's disappointing debut. An ad campaign starting early next year will focus more on the car's features and benefits, said John Mendel, American Honda Motor Co. executive vice president. One spot likely will detail the Insight's ability to "train" a driver to drive more efficiently. The ad will feature the Insight's fuel economy readout, which uses a scrolling video-game format on the instrument panel. Mendel said that ought to make the Insight appeal to buyers under 35 years old -- the target market. Since the Insight's debut, ads have been lifestyle-oriented, for example showing the hybrid transporting young people to the beach. The ads also have been highly stylized, relying on quick-cutting and inventive camera work. 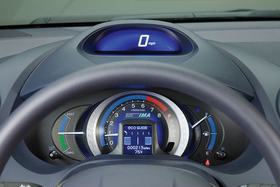 New ads for the Honda Insight hybrid will stress features such as the fuel economy readout. "Are we happy with how sales are going? No, we're not happy," Mendel said in an interview. "We are going to continue to market the car. But to call it a relaunch makes it sound like we did something wrong." Mendel described current market conditions as unfavorable for hybrids, what with fuel prices much lower than in the summer of 2008. Still, the Prius is outselling the Insight 6-to-1. Honda's initial 90,000-unit sales goal was revised to 60,000 because of the economy, but sales since its March launch total just 18,933 units through November.